A special guest blogger. Gups! Gups is actually my bff Megan. We have a long evolution of nicknames for each other. And Gups is the latest and greatest. I have known Megan since elementary school. We didn't go to elementary school together, but she did occasionally make an appearance at MY pool with her friends, so I saw her there. She wore goggles. I also knew of her because we played in the same district basketball league. She was tall and her mom was always doing her hair before games. She pretty much exclusively sported the low pony. Anyways, we become good, good friends through middle/high school, roomed together at an out of state, private college (all four years) and now that we live apart, we skype on a semi-non-frequent basis because she pretends like she is too busy for me. Jk. Jk. She also contacts me often to discuss what she should make for dinner, lunch, breakfast, or her next dinner party. I help her and she always takes my ideas and advice (after totally bashing the first 3-5 ideas I give her). Haha...we are friends like that. 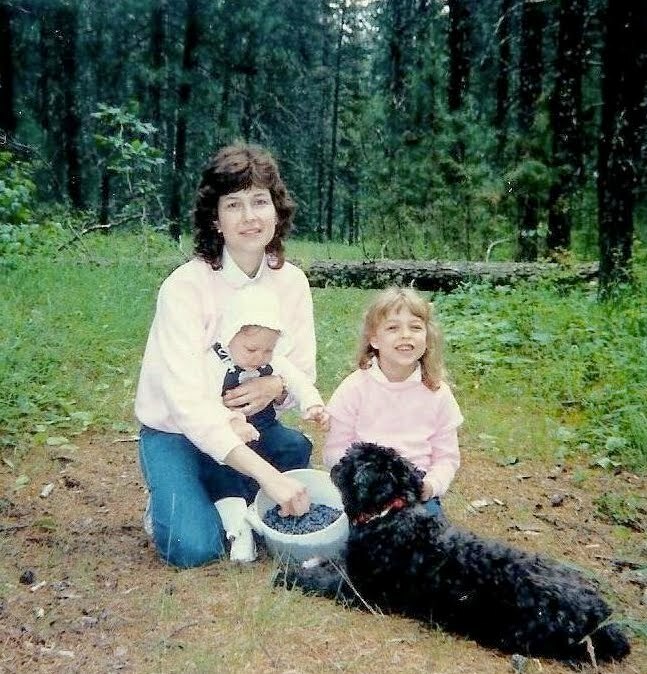 PS: Isn't she SOOOOOO cute (note: she is the baby in the bonnet)? I love blueberry pie. It's my second favorite of pies after pumpkin. When I was younger, we used to go blueberry picking by my cabin. It was one of my favorite things to do up North. We did it for a number of years until ticks got really bad and lyme disease and all that happened. Anyway, my mom would make an amazing pie with what we picked. We would also go to the blueberry festival in Lake George, MN. It's a three day festival that is all about blueberries - a blueberry pancake breakfast, a blueberry ball, a blueberry square dance. You can get blueberry pie, cobbler, crumble, jam, syrup, pretty much anything you want. Which I think is ok because blueberries are super good for you. Antioxidants and all that. So, I've found that people tend to be intimidated to make their own crust. Every time I make a pie, at least someone says: "Whoa, you even made your own crust? Way to go, Martha." Truth is, it's not that hard at all. I just use the crisco recipe, and I think it tastes pretty dang good. I would say the main things to be cognizant of are to make sure you only add a little water at a time and keep testing it until it just forms together, and also to let the dough chill before you roll it out - it keeps it from sticking. Sometimes if I'm in a hurry or am impatient, I just stick it in the freezer for like 10 minutes while I prepare the insides of the pie. Make sure when you split the dough that one is a little bigger than the other, cause the bottom takes more dough to cover. So when you roll it out, do it on a piece of waxed or parchment paper - easier to flip into the pie pan then. Put some flour down to prevent sticking. Roll that sucker out and make sure its a couple inches bigger than the diameter of the pan. I usually place the pie pan on top of the crust and then flip. Press down the edges against the pan, and then fill with the blueberry mixture. Top with a couple tablespoons of flour or corn starch to prevent runniness after baking. Roll out the top and flip that guy on top, seal the edges, cut slits in the top, and you're good to go. I usually take the pie out a few minutes before its done and brush the top with melted butter and sprinkle a little sugar on top. Everything's better with sugar on top. SHAPE dough into a ball and divide in two, one ball slightly larger than the other. Flatten ball(s) into 1/2-inch thick round disk(s). TIP For ease in rolling, wrap dough in plastic wrap. Chill for 30 minutes or up to 2 days. Combine ingredients for blueberry filling. Line pie plate with pastry dough. Fill with blueberry filling mixture. Sprinkle with lemon juice. Dot with butter. Adjust top crust over mixture, cutting slits for steam to escapes. Seal and crimp edges. Bake at 400 degrees for 35 to 40 min. 1. i LOVE that picture 2. i miss megan 3. when we went to your cabin that one time it was so fun and i want to go again. oh i like blueberry pie too.